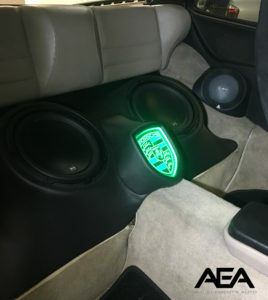 Check out this custom sub enclosure built by Jake to house 2 JL Audio 10W3 subwoofers and a mid-range enclosure for JL Audio TR650-CXi coaxial speakers in the front door panels and back of the car. The etched Porsche logo in LED back lit plexiglass looks amazing! 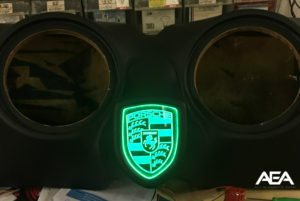 Custom enclosure for 2 JL Audio 10W3 subwoofers with etched plexiglass LED Porsche logo and a custom mid-range enclosure for JL Audio TR-650CXi coaxial speakers in a 1987 Porsche 944. 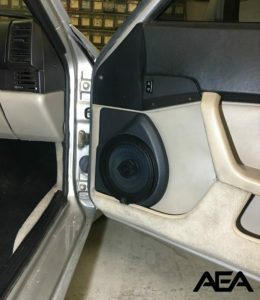 Custom door fabrication to house a JL Audio TR650-CXi coaxial speaker in a 1987 Porsche 944.